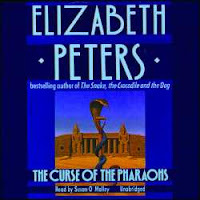 I have a habit of downloading things a bit at a time -- that is, with the Elizabeth Peters mysteries, I tend to download and burn only three discs at once, for some reason. Well, for several reasons, none of which compensate for the fact that I get through three discs just quickly enough for my online library download to expire, such that I then have to wait another week or two to download and burn the next three discs. Which is why it's taken me so long to listen to this. It's not that book wasn't good or enjoyable. It was great. I enjoyed it thoroughly. I just had to wait between downloads. I'm still working through the Susan O'Malley books since that's what I have access to currently, but I'm keeping an eye out for the Recorded Books versions done by Barbara Rosenblat, as per Nan's instructions. So, this is the second of the Amelia Peabody mysteries by Elizabeth Peters. It didn't disappoint. I'm avoiding summarizing and other spoilers for the first book in this review, but when I continue with the series I don't necessarily expect that to be possible. We'll enjoy it while it lasts. I really enjoyed this book, almost as much as I enjoyed the first. The sophomore effort in a longstanding series is always a hump that I, as a reader, am anxious about -- sometimes the second book just really can't possibly live up to the shininess of the first book, and that's always disappointing. But if The Curse of the Pharaohs wasn't quite as good as Crocodile on the Sandbank, that doesn't mean it was bad. It was quite a lot of fun, of the sort that I had expected to come from Amelia, and the mystery in this one was even slightly harder to figure out than the first one. An extra abundance of suspects helps with that, as does the fact that the foreshadowing is handled a little more gently. And when I say a little, I mean just the tiniest bit, really. Subtle foreshadowing is not an Elizabeth Peters strong point. Or perhaps I should say an Amelia Peabody strong point, because it is in Amelia's voice that we receive the entire story. These books are written almost like a diary, but more a report; dispatches from the field, perhaps, with Amelia the first person limited narrator. One thing I noticed in this book slightly more than the first was that Peters handles Amelia with gentle hands, but isn't above letting the reader see where Amelia's faults -- and faulty reasonings -- lie. There are occasions where Amelia will suggest something and the reader (or in my case, listener) will know that there is a different explanation, or she will tell us something and we will immediately grasp the significance of what she is saying but she will not, and sometimes never does. I like this about the books -- it's not that I like feeling superior to my narrator (there is no chance of that; Amelia is just too delightful) but that it requires me to do some thinking on my own, rather than having Amelia spoonfeed me everything. The reasons I don't think this book is quite what the first was? Well, the murder mystery isn't quite as original as the sort of mystery Amelia was solving in the first book. And the secondary characters, perhaps because there were several more and varied, weren't nearly as well-fleshed as the first set. As with the first, this one was slow to get started (though charming from the beginning, too) and I found I didn't care quite as much about anyone except the recurring characters by the end of this book the way I had cared for the secondary characters in the end of the first book. I am hoping that does change in the third book, because it was part of the reason I loved Crocodile on the Sandbank so much. I'm still recommending this series to anyone looking for a lighter cozy mystery with a fascinating, out-of-the-ordinary setting. Amelia's love of place (and perhaps Elizabeth Peters'?) 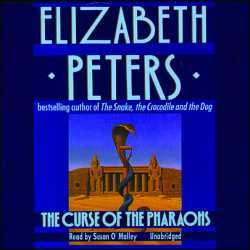 shines through in her descriptions of Victorian-era Egypt. One doesn't have to have an interest in classical Egyptian archaeology to enjoy the characters and plot, and my knowledge is very rudimentary, though growing thanks to these books. For anyone who has read these books and is interested in the archaeology, I'd recommend Harry Thurston's excellent and readable (if long) book on the Dakhleh Oasis Project, Island of the Blessed. It's an archaeological project of which Amelia would thoroughly approve, I think. Agree with the Barbara Rosenblat recommendation. Nothing wrong with O'Malley as a reader, but Rosenblat really brings the characters to life. Also, one of the Recorded Books productions (can't remember which story), includes an interview with Peters and Rosenblat, which is a hoot! I felt exactly the same way about this one. I love the way Peters handles the narration, and that the reader is at times aware of things that Amelia isn't. Lots of fun! I listened to the first by Rosenblatt, and then this one read by O'Malley, and what a difference. I tried not to let it lessen my enjoyment of the book, but I'd have to admit it did, a bit. Still, a very fun read! Gosh, both of you -- I'm really going to have to find a Rosenblat-narrated version of one of these books soon. I wonder if my library will ILLO one? All I have access to currently is O'Malley. Darla - I think it can't be easy to structure the narration such that the reader sees things that Amelia does not. Having what is left unsaid be as important as what is said is an art, I think.